What makes for a good Summer beach read? For parents, it could be a book that is easy enough to follow while simultaneously keeping your kiddies fed, entertained, and above water. For thrill seekers, it could be a book so twisty and compelling that you can't leave your beach chair until it's finished. For romantics, it could be a book that allows you to be swept away as easily as your flip-flops if you sit too close to the ocean. 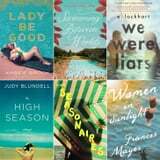 Whether your vacation pairs best with a funny romp, an addicting mystery, or an unforgettable saga, there's one thing all of these 100+ beach reads have in common: they all work best with a Summer cocktail in your hand and your toes in the sand.